Southwestern spaghetti squash bowls are an innovative way to eat this unique vegetable. Most of the time, we pair spaghetti squash with marinara sauce and meatballs. While there is nothing wrong with that, spaghetti squash can be so much more than just a replacement for pasta. This healthy and hearty bowl pairs spaghetti squash with black beans, corn, avocado and salty Mexican cheese. This vegetarian dish can be a meal all on its own. Step 1: Preheat the oven to 375 degrees Fahrenheit. Line a baking sheet with foil and set aside. Step 2: In a small bowl, combine olive oil with the chili powder and cumin. Brush the spiced oil generously on the flesh of spaghetti squash. Season with salt and pepper. 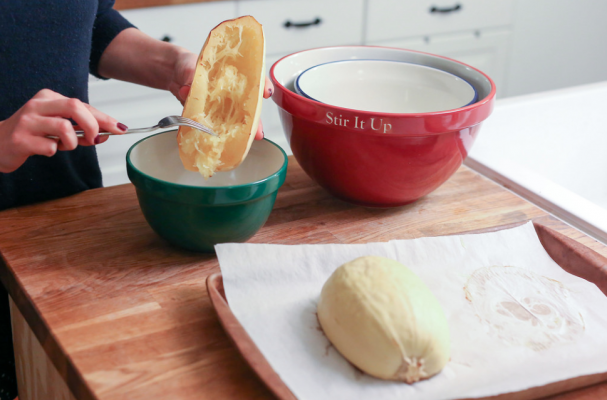 Step 3: Bake the spaghetti squash for 20 to 25 minutes or until the squash has slightly browned and is fork tender. Remove from oven and let cool. Step 5: Heat the remaining spiced oil in a saute pan over medium high heat. Add the black beans and corn and cook for 3 to 5 minutes until mixture has heated through. Step 6: Spoon the black bean and corn mixture into the squash boats. Top each bowl with avocado, cotija cheese and fresh cilantro.